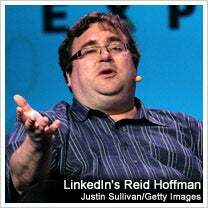 What do Twitter co-founder Evan Williams and LinkedIn's Reid Hoffman have in common besides an affinity for social media? They're both hopping mad about a new bill that they say threatens the vitality of startups, innovation and economic growth. In a letter to Congress last week, Williams, Hoffman and more than 100 other leading tech entrepreneurs voiced their protest over the recently introduced PROTECT IP Act. If the bill becomes law, it would give copyright holders and law enforcement officials enhanced power over Web outlets seen to be infringing against intellectual property. The letter criticizes the bill -- which is currently awaiting a hearing in the U.S. Senate with another version expected to be introduced in the House -- for burdening the infringing Web site and third-party Internet services that are linked to the site in question. "The bill will create uncertainty for many legitimate businesses and in turn undermine innovation and creativity on those services," the tech entrepreneurs wrote. What it is: The PROTECT IP Act -- or the Preventing Real Online Threats to Economic Creativity and Theft of Intellectual Property Act of 2011 -- would give the U.S. Department of Justice the ability to seek court orders against sites that break intellectual property laws. The bill would allow officials to seize certain digital assets of the infringing sites and potentially require third-party services such as financial-transaction providers, search engines, advertisers and Internet-service providers to stop doing business with the law-breaking site. What's good about it: The bill could arm content providers that have long suffered from digital piracy. For companies watching their profits disappear into the maw of online pirates -- both foreign and domestic -- the tool could offer a step forward. What's bad about it: The worry is the law will be used by bigger firms to legally harass smaller companies. A smaller competitor, for instance, could get locked from search traffic, merchant-banking tools and syndicated content as soon as a legal dispute begins, not after a judge makes a ruling. And the bill, should it pass, could burden all of those involved with significant new compliance procedures. Bottom line: It's too early to tell. As of now, the PROTECT IP Act is simply too unfocused to accurately predict how it will affect your market. However, the concept of holding all parties responsible for infringing on intellectual property is sweeping enough that the bill certainly needs watching by prudent business people. If you have access to intellectual property advice, by all means use it and to get a feel for how it could affect your business. But even if the bill passes, the Web is so difficult to police that it's hard not to wonder if the legislation will be irrelevant no matter what. How might this bill, should it pass, help or hurt your business? Let us know in the comments section.